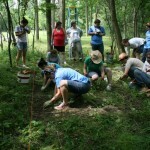 Having arrived and settled in, the Johnson’s Island archaeological field school began on Monday, June 7th. We met at the Gilmor Science Building archaeological laboratory where we had a short lecture introducing us to the history and context of the site. Johnson’s Island was used as the location for a prison during the Civil War holding only Confederate officers. This prison was the only one to be built by the Union as a stand-alone prison facility. On Monday afternoon, we traveled to the site and also toured the cemetery associated with the prison. Excavating began on Tuesday the 8th. 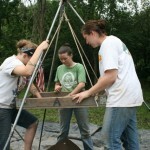 We have varying levels of experience but everyone is learning the necessary skills to be an archaeologist. When the program first began, we were just getting in our groove, but now we have established a rhythm and have our daily routine down. 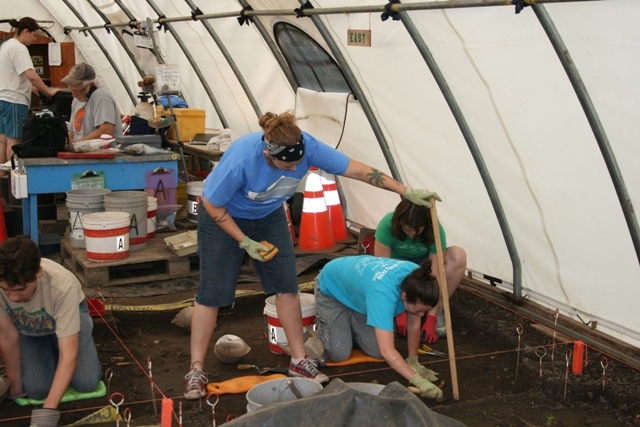 Each day begins with opening the tent and uncovering the units we are excavating. We work like a well oiled machine; each participant plays an important role in getting the site set up. Most tools are simple, shovels, mason trowels, root cutters, but some like the robolaser and the total station are more technologically advanced. The robolaser is a laser level that projects dots that we use to check soil levels. It is important to monitor how deep we are digging. 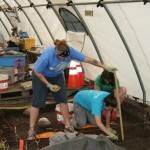 Our work began with excavating prison Block 8. A second objective was to locate an additional latrine behind Block 8. 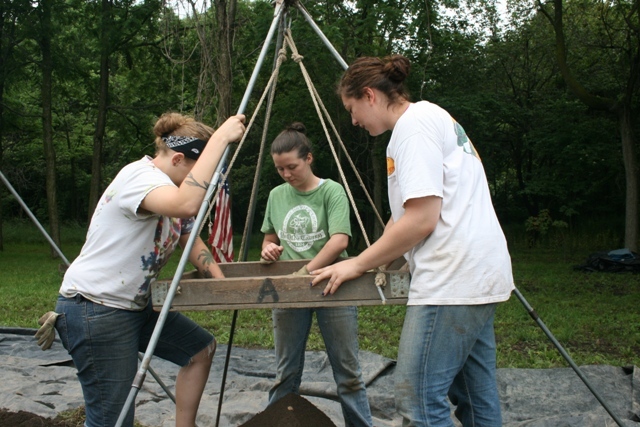 We took soil cores on Wednesday but did not find definitive evidence of an additional latrine. 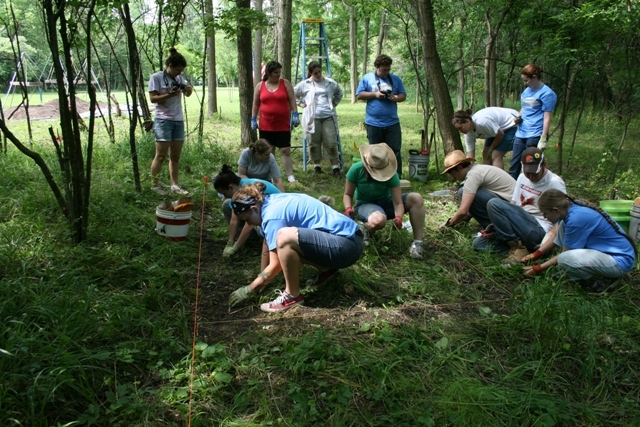 Later in the week the group began clearing and excavating the location of a latrine identified by Dr. Bush in 1995. 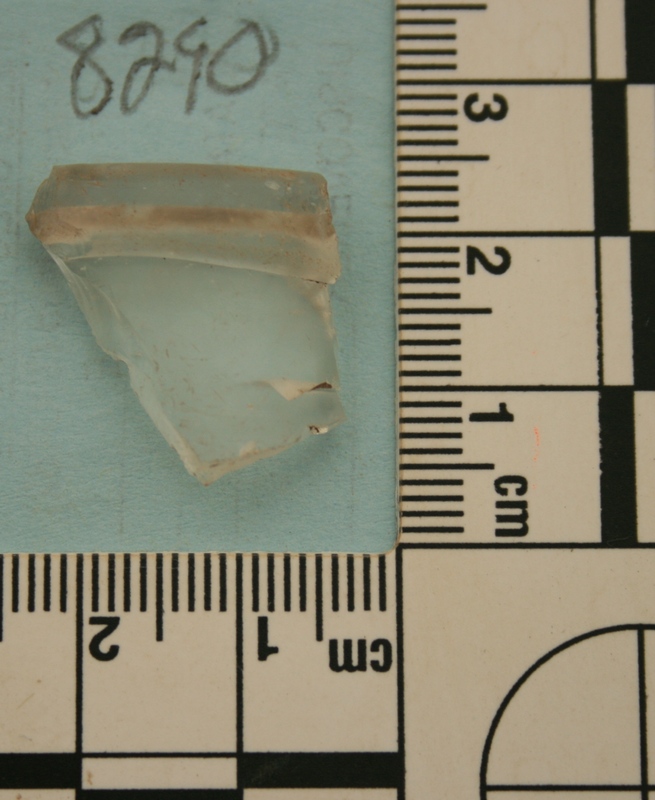 Latrines can yield a large amount of artifacts because anything dropped in them was not typically retrieved. They were also used as refuse dumps, or to hide contraband. 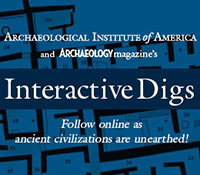 There is a chance we could find archaeological evidence of an escape tunnel. Our hopes are high. Clearing the ground in preparation of exposing the latrine for excavation. Screening soils searching for artifacts. Using the robolaser to check the unit level. 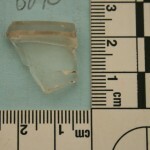 FS8290-Clear glass bottle finish fragment. This entry was posted on Thursday, June 17, 2010 at 8:12 pm	and is filed under Field Reports. You can follow any responses to this entry through the RSS 2.0 feed. Both comments and pings are currently closed.